Proteins, nucleic acids, polysaccharides, and polymers are of great importance to innovate the new materials for medical devices. These materials termed soft matters (soft materials) have the dynamic interface, soft interfaces, to induce the unique properties. Recently, several techniques to analyze the soft interfaces have been developed : a high-speed atomic force microscopy, membrane surface-enhanced Raman spectroscopy, cryo-transmittance electron microscopy/atmospheric scanning electron microscopy, dielectric spectroscopy, and time of flight secondary ion mass spectroscopy. These techniques provide the varieties of findings for an innovation of soft matters. Featured in this volume, the cutting edge of these techniques is introduced to survey the new current of the soft matters/interfaces. Structural biology has long been contributing to our understanding of how proteins function by providing their detailed structures. However, the revealed structures have been restricted to static snapshots, limiting the level of our understanding. 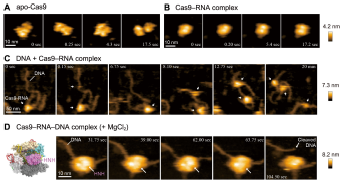 This restriction is now removed by high-speed atomic force microscopy (HS-AFM) that allows direct visualization of individual protein molecules in action at sub-molecular resolution under near physiological conditions. HS-AFM studies performed in the last few years have provided new mechanistic insight into the functional mechanism of proteins. 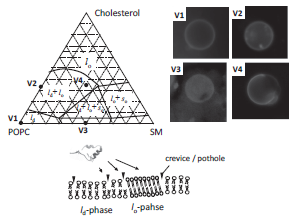 In this review, I would like to introduce our recent HS-AFM studies on proteins, including membrane proteins embedded in lipids and a DNA endonuclease. In addition, we demonstrated that developed HS-AFM for live mammalian cells is possible to image morphological changes of living hippocampal neurons. 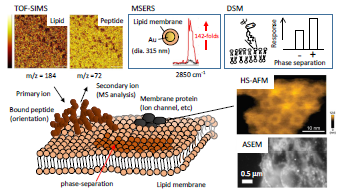 Here, we developed Membrane Surface-Enhanced Raman Spectroscopy (MSERS) method for the high-sensitive analysis of lipid membranes. 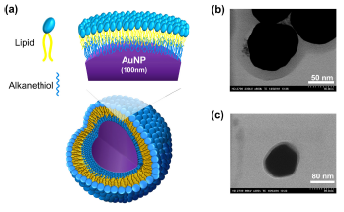 Phospholipid-modified Gold nanoparticles (AuNP@PL) were fabricated, which resulted in 50–200 times enhancement of Raman signals, depending on the aggregation degree of AuNP@PLs. This method can be applied to characterize the packing state of lipid membrane, and to investigate protein-lipid membrane interaction behaviors. In this review, the microscopic dynamics of lipid membranes analyzed by the dielectric measurement method is reviewed. The dielectric spectra for lipid vesicles involve the information on (i) lateral diffusion of lipid molecules, (ii) its rotational Brownian motion (Lr), (iii) water bound to lipids, and (iv) bulk water. The Lr mode suggested the generation of crevice/pothole on the vesicle membrane by a comparison with other spectroscopic methods. We further used the small sized-proteins to probe the membrane interface. Thereby, it was revealed that the boundary of inter-domain on vesicle membranes plays a role for the crevice/pothole. Thanks to the development of gas cluster ion beam (GCIB) such as an Ar cluster ion beam, the application of TOF-SIMS has been growing, especially in biological fields. GCIB enables sputtering of soft materials including biological cells and tissues to provide 3D images. 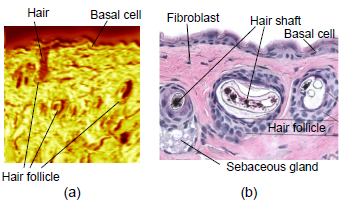 The features of the latest TOF-SIMS related techniques and applications of TOF-SIMS into biological samples, such as hair, skin, cells, and tissues, and bio-model samples for biomolecule investigation are briefly introduced in this article. 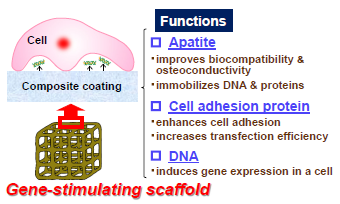 Calcium phosphate (CaP) coating on artificial materials helps to improve their biocompatibility and osteoconductivity. This review describes our biomimetic CaP coating processes using supersaturated CaP solutions. In the precursor-assisted biomimetic process, a substrate is initially pre-coated with amorphous CaP by alternately dipping in the calcium and phosphate solutions ; this is followed by the immersion of the substrate in a supersaturated CaP solution. This process effectively coats the entire surface of a porous material. In the laser-assisted biomimetic process, a substrate is irradiated using weak pulsed laser light in a supersaturated CaP solution. This process enables quick (<30 min) and area-specific CaP coating. By utilizing the aforementioned processes, various cell-stimulating substances, such as DNA, proteins, and trace elements, can be immobilized within the CaP coatings. Depending on the selection of cell-stimulating substances and processing conditions, the coatings can be designed to perform different biological functions. Our coating processes can be potentially used in several biomedical applications including bone tissue engineering and tooth surface modification.